Hi guys!! Happy Friday!! Did you have a great start in the new year? I hope you did :). I have noticed that lately I have been doing manis with light, bright colours, so I decided to do something a bit darker, even gothic if you will. Not that I complain about my colour choices but still, I wanted to do something different. I used A England – Fated Prince as a base on all my nails. After the polish dried I applied quatrefoil nail vinyls and brushed over one coat of A England – Bridal Veil. You probably noticed by now that the ring finger is a bit different from the others. Well I wanted to do the same with all the nails, but somehow I didn’t like it too much. I wanted to leave some of the patterns out so that there would be more versatility to the mani, but I didn’t like how it turned out on the ring finger so instead I did all the other nails with full pattern. 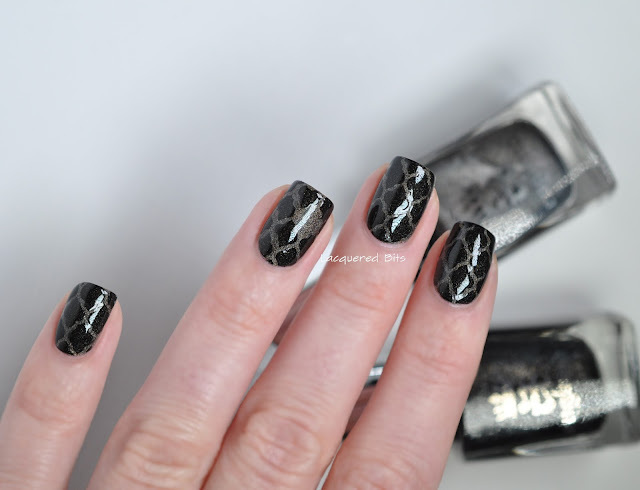 What do you think of my quatrefoil nails? Do you like the ring finger or are the others better?